Techne Needs Your Support for Our Summer Workshop Tour! 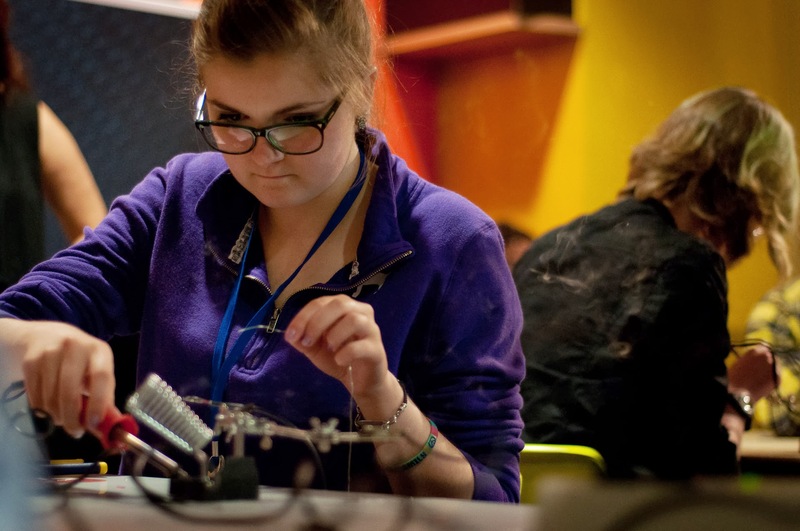 Rain City Rock Camp for Girls .. solder time! Techne has officially kicked off their 2014 Girls Rock Camp Workshop fundraiser! Last summer TECHNE brought their DIY electronic music workshops to over a hundred young women at Girls Rock Camps in Oakland, Sacramento, Portland and Seattle, and they were a huge success! This year we’re continuing our partnership with several US-based Girls Rock Camps with an ambitious goal of presenting workshops in 8 cities including Philadelphia, PA, Baltimore, MD, Washington, DC, Charlottesville, VA, Nashville, TN, Charleston, SC, Baton Rouge, and New Orleans, LA! We are also adding a new twist: a concert in each city, featuring Bonnie & Suzanne in duet, and fellow local female artists. These events will provide much needed modeling of women electronic musicians practicing their craft. We’re asking for your support to bring TECHNE workshops to hundreds of young women this summer! Please donate to our Indiegogo campaign and become a crucial part of the Techne revolution! Support TECHNE’s mission to bring DIY electronics and improvised music workshops to young women everywhere! See photos from Girls Rock Camp Workshop Tours & Previous events.